A Swizzle stick (no, not the one that is used to mix cocktail drinks, etc.) is used for mixing powdered milk or any other powder and water mixture. Some people even use it to mix callaloo. This is another simple but effective utensil found in any Trini kitchen. The swizzle stick is used similarly to the dhal gutney; twirling between the hands. 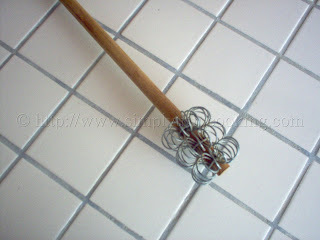 It is made by coiling wire and then wrapping the coils, usually three, around the stick used. This is another easy utensil to make if you’re a D.I.Y person. To learn how to make a Trini swizzle stick click here. Any West Indian shop is supposed to have it.